Onteca has been blogging for some months now, with lots of insight into games and new media production. With two games in production, and a constant process of research and development backing up our future activity, it might be worth a look. Only solid ‘news’ will make it onto the front page from now on, still the ephemera of creativty and ongoing business may amuse. Long-time Onteca collaborator and friend made two films last year. One was produced by Onteca, one was made for Film Lounge by another chap with Onteca connections, Xavier Leret. This other film is called ‘Kung Fu Flid’. They messed with the wrong flid! If you are a fan of great action films with laughs and sharp dialogue then this one is for you. (As long as you are prepared for a little sick humour along the way). Kung Fu Flid is available to stream at Film Lounge. There is a programming language that obeys some of the structural impulses of the infamous LOLCats invented dialect, or something like that. Dan and Ben suggested that I didn’t blog about it, as it takes a coder to truly get the joke (or explain it). Well, this will persuade Dan or Ben to add their own comments. In the meantime, there is something very dizzying about a comedy Internet meme involving fluffi kittehs transforming into an example of post-scarcity, ludic, agalmic potlatch. There is a current and rather excellent training scheme delivered on behalf of North West Vision and Media. (Except it closed on the 17th of April, and we are now interviewing for those shortlisted). Aimed at people who want to be producers in the multi-platform future. This is a great opportunity for paid training and eventual placements with great companies like the BBC, McCann Erickson and (cough) Onteca. This is a chance to become part of what is a very exciting world. An industry event that appears to be useful and thought-provoking. Then again we are living in ‘interesting times’, especially for old media. I’m tempted to point out ‘all their base r belong to us’, were that not all a little 1997. In the meantime, it looks like the ARG horse is still being flogged, Was there ever a point in time when this particular format was alive, rather than just a seam of digital fake-gold seeded in the internets to lure investors? Thing is, giving life to simulacra is what we do, so maybe the next iteration will go beyond the existing tiny demographic into a mass market or two. Onteca’s forays into the merging of of gaming and TV have shown plenty of scope for the field. 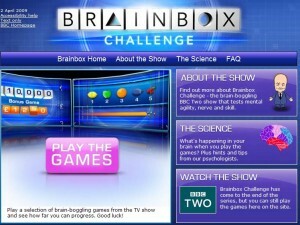 In fact our collaboration with the BBC for the Brainbox Challenge series of games has become a talked-about proto-type of the genre, demonstrating the truly disruptive potential of this approach. Onteca is going to do further work in this area. Three of our programmers have just returned from BBC training in MHEG, a language for creating terrestrial interative TV. Under a hundred people in the country can code using this rather useful language. Good job, though, that we didn’t pursue our plan to create a widget for helping content creators to make interactive TV. As it seems Yahoo had the same idea. Reason why Onteca has a policy of not getting over concerned with IP; if your idea is any good, someone else is thinking along the same lines anyway. Still, looks like an entertaining event. Made us hungry for more. Roll on BTween, which is in Liverpool this year.